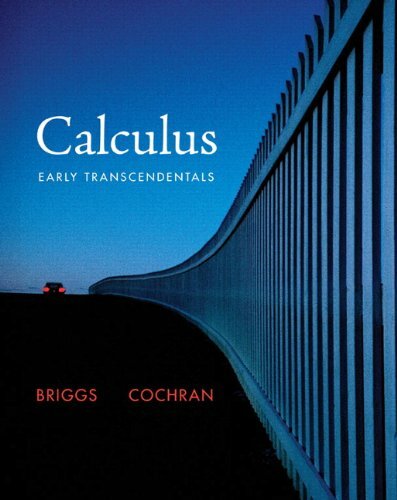 Drawing on their decades of teaching experience, William Briggs and Lyle Cochran have created a calculus text that carries the teacher s voice beyond the classroom. That voice evident in the narrative, the figures, and the questions interspersed in the narrative is a master teacher leading readers to deeper levels of understanding. The authors appeal to readers geometric intuition to introduce fundamental concepts and lay the foundation for the more rigorous development that follows. Comprehensive exercise sets have received praise for their creativity, quality, and scope." Used Good (10 available) Shows some signs of wear, and may have some markings on the inside. 100% Money Back Guarantee. Shipped to over one million happy customers. Your purchase benefits world literacy!